It’s nice to know what might be mistaken for apathy is actually merely ineptitude. You’d be forgiven for thinking the Vikings had given up after it appeared Adrian Peterson suffered a season-ending injury that thankfully turned out to involve no broken bones. Peterson’s shifty, untouched dance to the end zone for the first score of the game to give the Vikings a lead in the fist quarter was followed by Peterson’s injury, then by five unanswered Raiders scores as Oakland built a seemingly insurmountable twenty point lead. The lead seemed insurmountable because the Vikings were playing as if it were…until they found life in the fourth quarter to make a game of it. Ultimately, they failed to take advantage of the opportunities the Raiders kept gift wrapping for them in the form of turnovers and penalties. All things considered, the defense played a fantastic game on one leg and with one arm tied behind its back. Asher Allen shadowed rookie Denarius Moore to keep him to one catch on the day yet gave up a touchdown to a different rookie. Chad Greenway got his first sack of the season, as did Kevin Williams. Jared Allen was shut out but Brian Robison picked up the slack with a sack of his own sack. 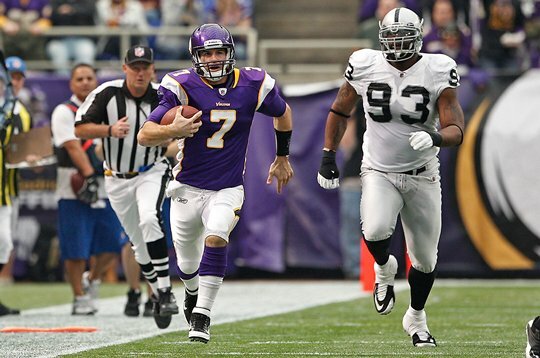 The defense forced multiple three-and outs and Robison forced a fumble to give the offense the ball in the fourth quarter, which Christian Ponder capitalized upon with a perfect throw he dropped between two defenders to Visanthe Shiancoe for 37 yards and followed up with a one yard pass to Kyle Rudolph for a touchdown. But for as good as Ponder looked on that major league throw to Shiancoe and on his 71 yards of rushing, three ill-advised passes turned into INTs, two in the red zone. You can call that growing pains and you’d be right. But with Peterson out, there was nothing to keep the Raiders honest (as if they were going to be anyway) and they kept sending the blitz. The combination of a porous offensive line and receivers who can’t separate with one-one-one coverage is a deadly combination for our rookie quarterback, particularly so when you don’t have the Peterson punishment to dole out. Unfortunately, we can only expect more of the same for the rest of the season. As ugly as it was at times though, it’s nice to see that the Vikings didn’t give up like they did against Green Bay. “Minnesota Vikings’ Christian Ponder faces career-defining comeback – then, nothing.” That was the headline of a Pioneer Press story yesterday. It’s a tad early to start defining a rookie‘s career, isn’t it?